I'm not gonna lie: there was no way after reading the title of this book that I wasn't going to read it. And I'm glad I did! 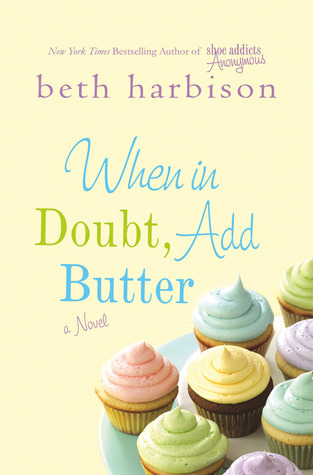 It was an enjoyable, light read about a serial dater -- a funny, confident woman who makes her living as a personal chef -- who finds love unexpectedly. Although this is a classic romantic story -- told very well, with many swoony sighs -- it's almost more about Gemma herself than it is about Gemma finding love, and I liked that about it (In that way, I guess the book might better fit into the "chick lit" category). Gemma is passionate about food, and cooks for a wide variety of clients. Some are her friends -- or eventually become friends -- and some are more like enemies. And one may or may not be Russian mafia. Getting to know Gemma and her clients and watching those relationships develop was as much fun as seeing her find her way to romance. Bottom line: a light, enjoyable read. I loved so many things about the book, except the sad, sad, sadness. Don't get me wrong, every emotion in this book was realistic and plausible and grounded -- exactly why I liked it. But, like one of my favorite heroines Fair Finley, I prefer everyone to win and no one to be sad. Unfortunately, I know life doesn't generally turn out that way. 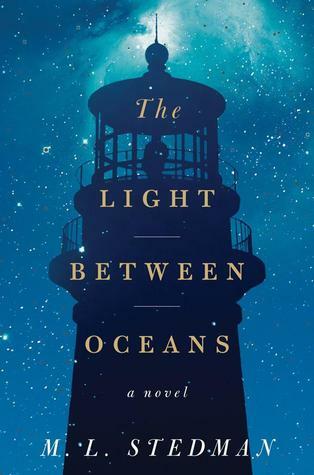 Back to Light Between Oceans -- the writing was beautiful and evoked a tremendous sense of place for me. I've never been to Australia, but now I feel like I have. I could imagine the sounds and smells of Janus and the lighthouse, and feel the wild, desolate beauty of it. The characters were so real and genuine -- this is part of why the heartbreak of the story struck so spot-on, because every action and emotion felt genuine. I felt like the events were happening to people I knew. I appreciated that while the author told a messy story, it felt grounded to me, rather than melodromatic (fully realizing that some people may dissagree with me). This was a book club pick, and while I haven't read any reviews of this, I'm curious to get the reaction of other readers, especially parents. I'm aware enough to realize that my reading experience as a non-parent is probably going to be a lot different. This book made me think about everything that goes into informing our choices as individuals, and the heartbreak of feeling like you have to choose between two bad things, especially when the choices involve other people. And really, that's another point to the story, I think: we like to imagine that our choices only affect us; but they rarely do. And I like that in the end, the story is as much about not just making choices but about what happens after, and about learning to keep going and live with the choices you've made. I just finished Stay Awhile, the third book in the Wilfair series by Alysia Gray Painter. I talked about the first two books here. Stay Awhile is more of the same awesome blend of humor and heart, with the added bonus of some major swoon. I mean...seriously is-it-hot-in-here-or-is-it-just-me kind of swoon. Fair, if you don't meet Gomery at the diving board I WILL (well...I'm married, so probably not, but you get my drift). Alysia Gray Painter has some serious skills -- I have rarely read a book where two young adults creep so slowly toward a possible relationship (like mastadon slow...rrowr), and yet they generate enough electricity to light up all of Los Angelos. But aside from that...I'll admit I was a little concerned at first that not enough plot secrets would be revealed, but thankfully, Ms. Painter delivered lots of juicy plot bits along with some really great character development. Bottom line: still love these books! Quirky fun. 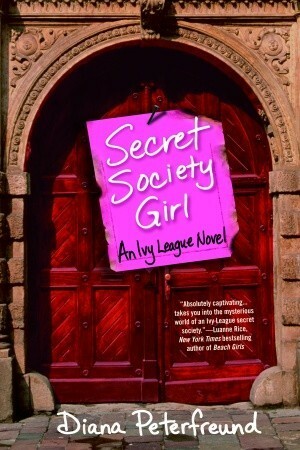 Secret Society Girl by Diana Peterfreund is smart and funny, and Peterfeund's writing goes down nice and easy. But don't mistake her breezy writing style for a lack of substance. In this book -- the first of a four-part series -- Peterfreund introduces us to Amy Haskell, a junior at an Ivy League university who gets tapped by the oldest and most prestigious secret society at Eli University. She and the other four girls in her tap class are the first females ever initiated into Rose & Grave, which leads to a generational battle and just a little bit of self-discovery. What I loved about this book is its resounding ring of truth. Although a far cry from my own small Christian liberal arts universtiy experience, I had no problem believing everythign this book was selling me. Although there were a lot of tertiary characters introduced that just muddled things for me, but I'm hoping that will sort out a little in the next books. The various relationships in the book drove this home -- there are old friendships, new friendships, family relationships and romantic relationships. But really, the book is about Amy, and about her experiences her junior year of college. Certain things get resolved, but it's not a "happy ever after" kind of book. You know Amy's got a lot of life left ahead of her -- and I'm excited to read the next books and read more of that life. I am a political misfit. I am conservative, defined by me as preferring an emphasis on government that skews toward less federal, more local. I am in favor of a government treating its budget the way a smart manager or individual would treat their business or personal budgets -- i.e., your expenses should not exceed your income. I'm in favor of low taxes and less regulation. I believe in social justice. I believe in being compassionate to the ill, poor, homeless, widowed, orphaned and truly marginilized. I believe that if you are an employer, you have a responsibility to treat your employees with respect, to provide a safe workplace, to provide a living wage, and to compensate them based on work done, not on age, size, race, gender or any other irrelevant factor. I have no problem with a CEO or business owner making more money than one of his employees -- I do have a problem with greed, and I have a problem if a CEO sits comfortably in a billion dollar home while her employee can't afford to pay rent and buy groceries at the same time, despite a job well done. I believe in personal agency. On my own, I may not have much, but I have free will. Give me room to make my own choices and experience the consequences. Give me room to improve myself and my future...or to choose to be comfortable where I'm at. Allow me the freedom to extend my own hand to the homeless with a sack of groceries and a smile, to give and serve and love my neighbor. Legislating morality doesn't work...not in the long run. (for a great example, see the Bible. Old law vs. new law). Forcing me to be kind, compassionate, and ethical will eventually make me resentful and mean and petty. Don't get me wrong, I still have a choice. But that can be a tough internal battle. In addition, when the government takes over my job (as a human being) of taking care of my fellow human, then I'm likely to stop seeing my fellow human altogether. Why should I care about that orphan over there? The govenment will take care of him. I need to take care of myself. Why should I give to this charity? Don't I already pay half my income in taxes to take care of that? I'm going to think about me again. And then everyone's thinking that....and no one is thinking about the single mother, or the poor student, or lonely elderly person with no family. Because we're all too busy thinking about ourselves. I believe in being responsible with my resources -- and that includes the physical world in which I live in. I don't litter, I try not to be wasteful, and I'm a big fan of green and growing things. There's a lot of people on this planet, and we're all consumers. We need to be careful of what we have and treat it with gratitude -- because life on this earth and everything in it is a gift. Remember that whole personal agency thing? Yeah, it applies here too. How about more rational dialog and conversation and less fingers-in-the-ears-nah-nah-I-can't-hear-you. If you're politically liberal -- just because I'm fiscally conservative and pro-small government, don't assume that I'm heartless, cold, uncaring and greedy. If you're politically conservative -- just because I like reusable grocery bags, like giving people a helping hand, and believe in equality and safety in the workplace, don't assume that I'm unintelligent, or out to get your money. And hey, while you're at it, why not extend that same non-assumption courtesy to other people. How about we have more conversation and less fighting. How about we blur the lines a bit more and stop further entrenching our extremely polarized political system. Who thinks a two-party system is a good idea, anyway? In my last post, I talked about a book I'd read that I wanted to like more than I did -- a book that felt more like a message with a story rather than a story with a message. 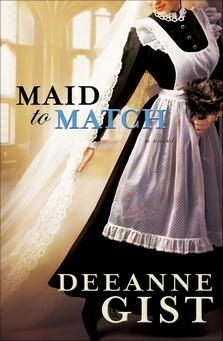 Maid to Match, by Deanne Gist felt like the antidote to that book. I was in the mood for something light and sweet, but with characters and plot and action that felt real and grounded and interesting. Maid to Match fit the bill exactly. Set in Asheville, N.C. during the era of the Vanderbilts (think Downton Abbey, but in the Appalacians), this book tells the story of a sweet, compassionate parlor maid with her sights on being lady's maid. She's prepared for this her whole life, and doesn't have place in her plans for romance. Enter Mack Danvers (who, based on Gist's description looked an awful lot like Chris Hemsworth in my head. Just sayin'), a mountain highlander whose sole purpose in coming off his mountain is to make enough money to reunite his family and pull his sister out of an orphanage. The villianous orphanage-master walked just on this side of the line of campy villian, but the rest of Mack and Tillie's story had a ring of truth and genuineness. Tillie's concerns were real -- she wanted to please her family and take care of others, and could only see one way of doing that. Later in the story, she may have been naive, but she wasn't stupid. Mack was an enigma -- an educated, well-mannered mountain man. The son of a teacher and a local highland girl. His pursued Tillie respectfully, but with passion and confidence. Swoon! Deanne Gist is one of those writers who can create some truly great romantic tension, while still keeping things rated PG. Oh, Melina Marchetta. When I try to describe why I love Melina Marchetta's books so much, I always say "they punch me right in the gut...but in a good way." 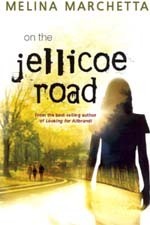 Although for some reason I had a bit of a harder time getting into Jellicoe Road, I eventually settled into this story of friendship, love and family. I think that's what really sets Marchetta apart for me: her books are about relationships of all kinds. Her books take a look at the whole of a person's life, even if we're just getting a glimpse at a small piece of that whole.